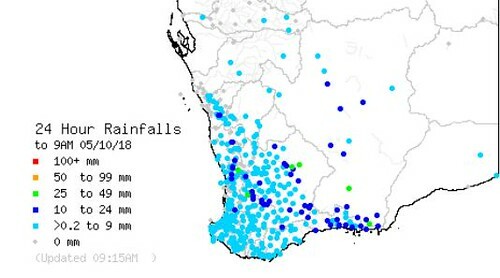 If someone at the start of the year said this is what the winter rainfall of 2018 would look like I think most would be pretty happy with that lot. 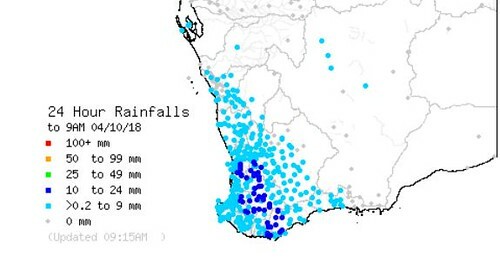 Considering the rainfall outlook for winter at the start of the year was not looking anywhere near what was recorded especially in the south west coastal and adjacent areas. Some spring rain to finish off the wet season is just what the doctor ordered. 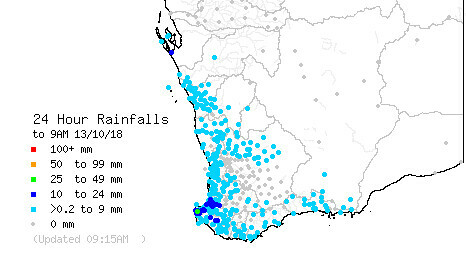 Trough bringing more finishing rains to the south west and adjacent areas. And some more spring rain . Front bringing more widespread moderate to heavy rain to the southern part of the state . Farmers getting good finishing up rain ....looking like a bumper crop. Low pressure system and trough bringing a few showers to the south west, south coastal and adjacent areas . Also pretty cool temperatures for this time of year.. 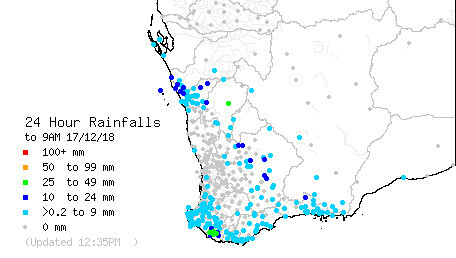 The rain in Oct certainly freshened up the area around Busselton to Augusta. Looked nice driving through that region past few days. Also surprised to see how comparatively dry it is from Hillarys and northwards, compared to the greenery evident in Perth itself. Yer Petros they have had good winter/spring rains down the southwest and adjacent . The death lilies on the side of the road between Busso and Cowaramup are amazing. Absolutely, also the tall flowing stems from the tree ferns Bunbury-Busselton. Plenty to look out down there. Hi LD good to have you onboard . WA Bom have a forecast temp of 49C for next Thursday.Maybe a good chance of touching the 50 mark. 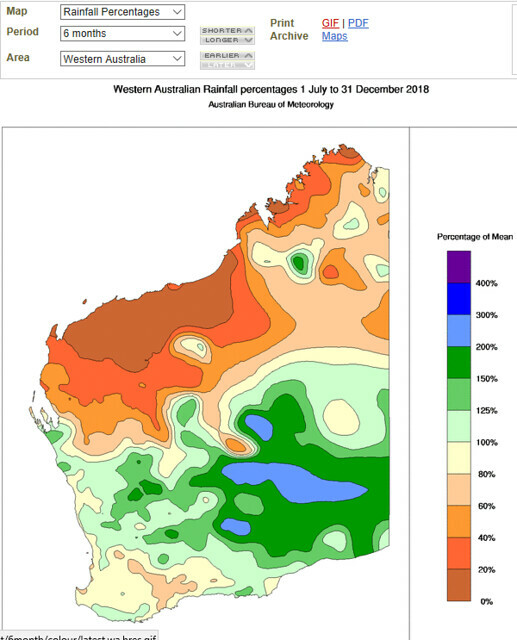 Trough bringing some rain to the Gascoyne ,Mid West and the South and South West of the state . 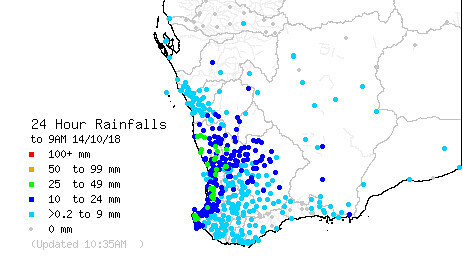 Some rain still around with the trough especially in the Great Southern region. It was a fairly good year in the Midwest to South East for rainfall in the last 6 months even though a few areas were up to 30% below average for the year. 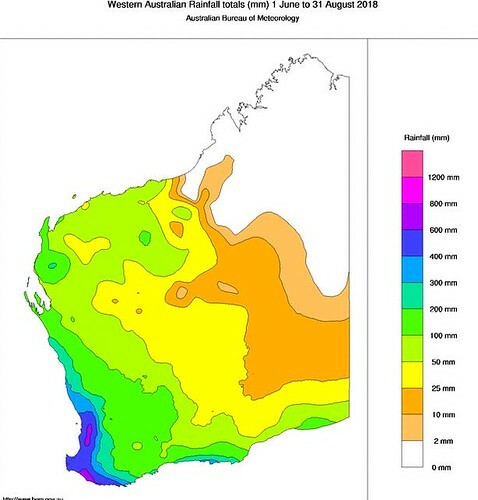 Considering what a dry year does bring in rainfall its usually all good if you get about 75% of your average in W.A. Hot one in Perth and surrounds today already 40 with a light hot Northerly blowing. Beach is amazing though water around 24 ...soooo refreshing . The western flank strengthens during the day and wraps , with a strong wrap around flow from the west targeting near the Perth vicinity in the afternoon evening. Generated in 0.068 seconds in which 0.054 seconds were spent on a total of 14 queries. Zlib compression disabled.